2006 started with Kellisa’s 4th surgery in four months. Both hips were dislocated again, requiring another surgery of cutting bones, inserting screws, and hardware. It was followed with the same six brutal weeks of recovery. After 18 months without a trip or trail, I was eager to get Kellisa back outside. I wanted to push our limits and see what we could do on trails. 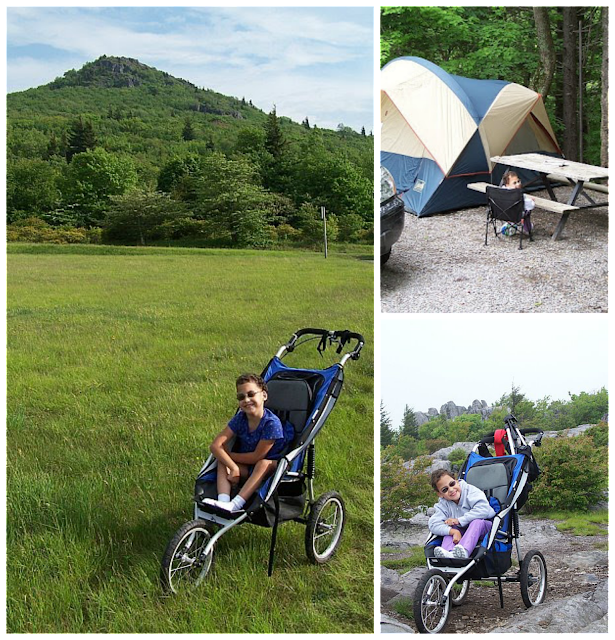 I even bought the largest baby jog stroller I could find so we wouldn’t have to use her wheelchair anymore. We took a family vacation to Arizona for spring break. Our itinerary included the red rocks of Sedona, a few national monuments, and the Grand Canyon. 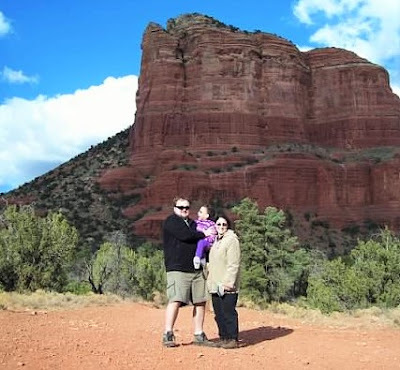 We completed several scenic trails in and around Sedona. The landscape was breathtaking and the rocky ground provided a nice surface for pushing Kellisa. 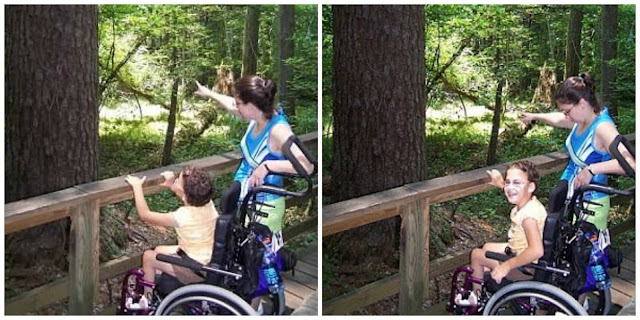 The trails were far from ADA approved, but also far from challenging. Kellisa enjoyed being pushed up and over the rocks on the path. We gained valuable experience as we hiked one trail in Montezuma Castle, Sunset Crater Volcano, and Wupatki National Monuments. Each trail had it's own challenges, from rocks, to snow, to elevation changes. I was hooked and I could tell Kellisa was as well from her frequent requests for "more". The Grand Canyon was our last stop on our vacation. The best was definitely saved for last! 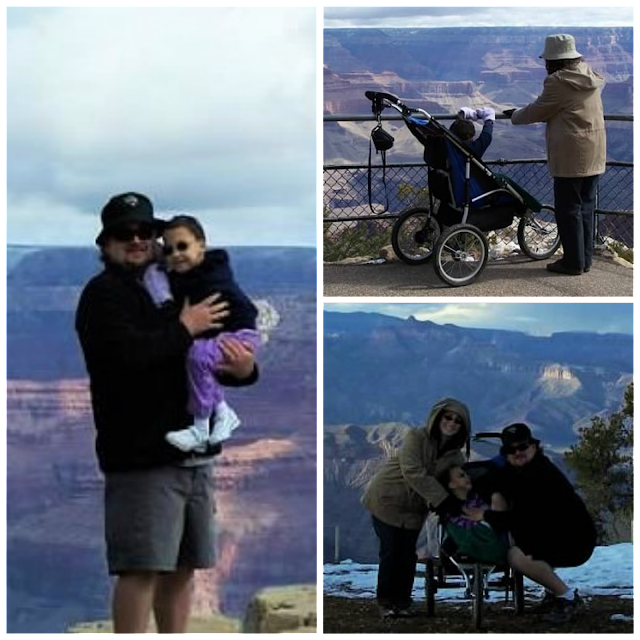 We were surprised to find the Grand Canyon South Rim covered in snow, ice, and freezing temperatures. One of Kellisa's tires on her jog stroller went flat. Our only option was to buy a fix a flat can at the gas station. Shortly after I connected the can to the tire it exploded sticky goo everywhere. The fix a flat was designed for a car tire and it took about 3 seconds to over fill the small tire on the jog stroller. I was a disgusting cold mess, but the tire was fixed. The South Rim has sidewalk trails along the edge of the canyon, but the winter conditions added to the danger. We were hoping to hike down into the canyon a little, but we turned around due to the weather conditions after 15 minutes of hiking. A park ranger explained the Golden Access Passport which allows Kellisa and her family to visit national parks without paying entrance fees. It also reduces camping and most other fees by 50%. Another perk is that it allowed us to drive on roads in the Grand Canyon National Park closed to visitors. As a souvenir of her visit, Kellisa picked a t-shirt with a large furry tarantula. This would spark her passion and love of spiders, bugs, snakes, lizards, and alligators that continues to this day. We created some action and adventure in our back yard by giving Kellisa a slide and swing for her birthday. 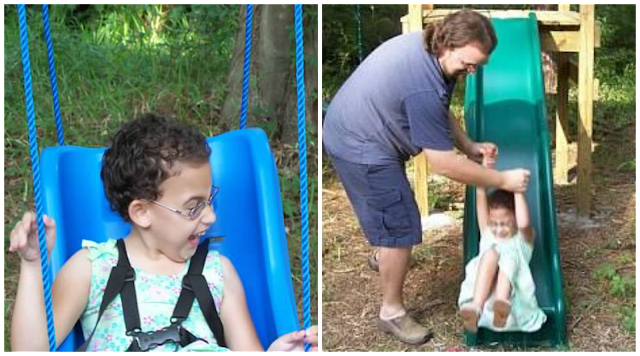 Our summer started with a trip to the Virginia Highlands. It was our first father-daughter trip, which gave Lisa a much deserved break from managing Kellisa and all of her appointments. 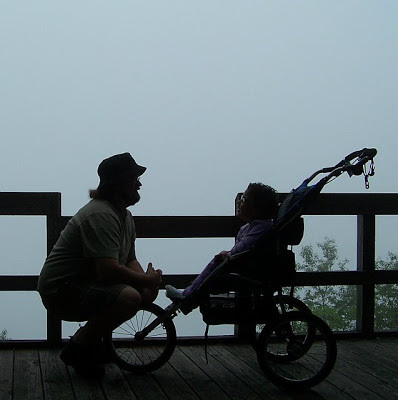 While camping far from cell service and help, Kellisa had a major seizure in the middle of a thunderstorm filled night. Trapped in a tent, it was one of the longest and scariest nights of my life. I decided to cut our camping trip short by one night due to my fears of another seizure. With an earlier start to our drive home, we were able to make a side trip to Mount Mitchell, the highpoint of North Carolina and actually the highest mountain east of the Mississippi. As I was struggling with the short, but steep and rocky trail to the summit while also carrying a folding chair for Kellisa, I had a state park ranger comment that she's never seen anybody trying so hard to get to the summit. Looking and thinking back, I have no idea why I carried the folding chair when I could have just as easily left Kellisa in the jogging stroller? I was still having nightmares about Kellisa's seizure in the tent when it was time to plan a trip for the long 4th of July weekend. I needed to take a step back in taking Kellisa to wild places. I found Congaree National Park in South Carolina on a map. With a little research, I was excited to learn the park has a 2.4 mile boardwalk that stretches deep into the swamp. As our outdoor hikes progressed over the years, I've come to usually dislike boardwalks and paved trails because they're usually short and rarely lead to anything spectacular. The boardwalk at Congaree is the crowning exception to both reasons and we've been back several times. 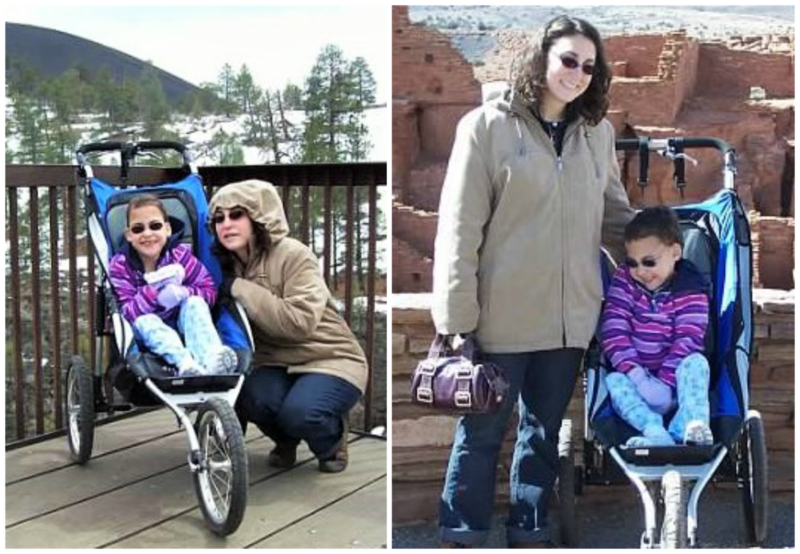 In early October, Lisa received a call from school that Kellisa was hurt and 911 had been called. 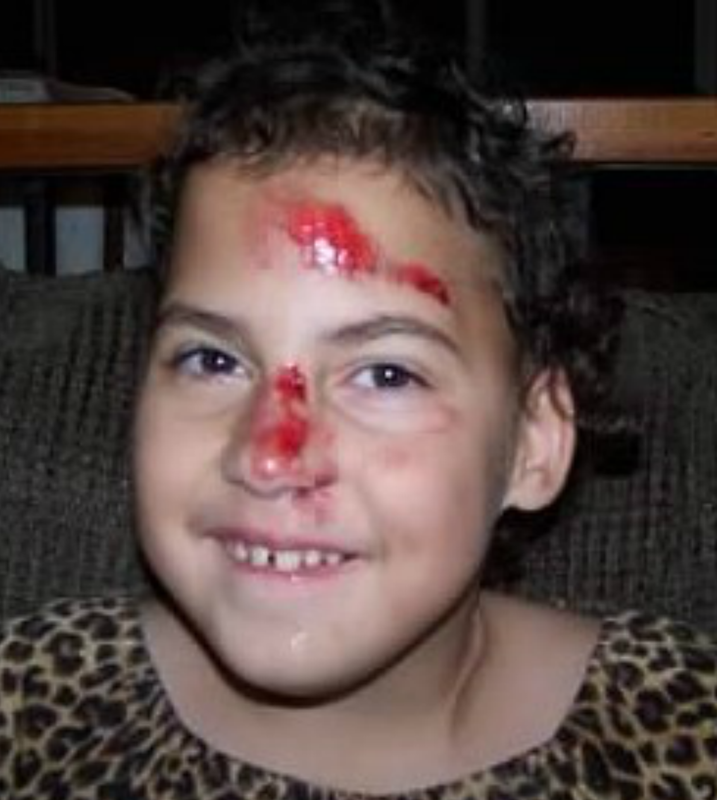 The school nurse thought Kellisa had a concussion and broken nose. Lisa arrived at the school to find Kellisa bleeding from her forehead and nose. Firefighters and EMT arrived shortly after Lisa. Kellisa enjoyed the ambulance ride to the emergency room and all the attention she received from the all male response team. I never want to see Kellisa hurt, but I love the fact that she fell on her face during a “normal” activity. She was chasing a boy on the playground when she took a turn too fast and flipped the chair face first on to the concrete. After the fall, the school wanted to keep Kellisa inside at recess to keep her safe and we had to fight the school so Kellisa could continue going outside for recess like all the other kids. Our thinking was, if she could run, her knees and elbows would get scraped, but she would be allowed to continue her normal recess activities. This is one of the few school battles we won. 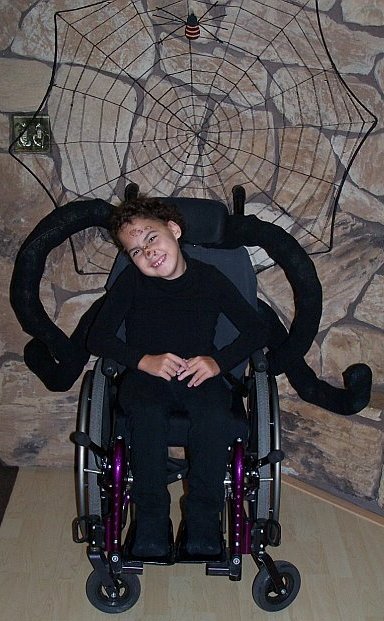 Kellisa dressed as a scary spider for Halloween and Lisa was able to use the wheelchair as part of the costume. Kellisa never let the falling on her face slow her down or keep the smile from her face as we ended our most (non-medical) adventurous year to date.